Today, most of us here in America can still buy sugar which comes in a paper bag. Yet, paper is no stranger to sugar since wrapping it in paper goes back quite some time in history. 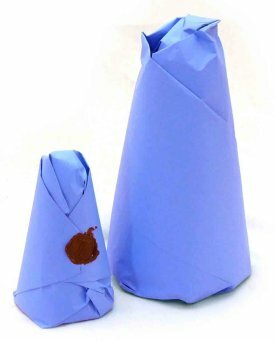 Although sugar cones, or loaves as they were also called, wrapped in paper are found much earlier than the 19th century, references from the early 1800’s show that if you found yourself in the Merchant’s shop to purchase sugar you would still find cone shaped loaves that were wrapped in a blue-purple paper. This type of blue paper could also be found wrapping linen and various articles in early shops. The sugar wrapping at some point became more specifically known as thick purple paper. One source says that blue cotton rags [which would have already been dyed indigo] or unbleached material dyed with indigo were made into paper thus creating the blue papers shopkeepers use to wrap their various articles. In the same way the dyestuff called Logwood was added to create the purple papers for sugar. The blue and purple papers fell into a class called, ‘Sugar-Blues’. As was common to the period re-using these papers in some way would have been put into practice. To housewives it was oftentimes suggested to reuse these purple papers for dying small amounts of wool or other fabrics a slate, grey or even purple hue when used with vinegar and alum. Also, if you were science-minded you could, as it was suggested in the 1820s, use the sugar wrapping to tell the difference between Oxalic acid and Epsom salt. These are just to name a couple of examples. Now usually these cones themselves were not small. They could be upwards of nine or ten pounds. Today that’s about two five pound bags of sugar. According to one book I read in the early days of the 19th century thrifty families could buy one of these cones and they would last an entire year. Can you imagine only two bags of sugar lasting an entire year! That is frugal indeed! In those families the primary sweeteners would have been molasses, maple syrup and honey. 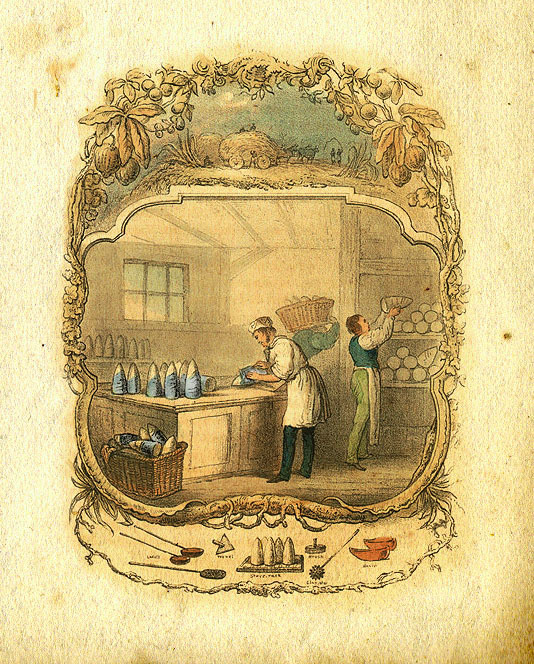 Sugar was certainly a precious commodity in the early part of the 1800’s. An array of tools for cutting or nipping the sugar was called for. For cutting into lumps of equal size and regular shape it would have probably not been entrusted to servants in fear of waste or clumsiness. 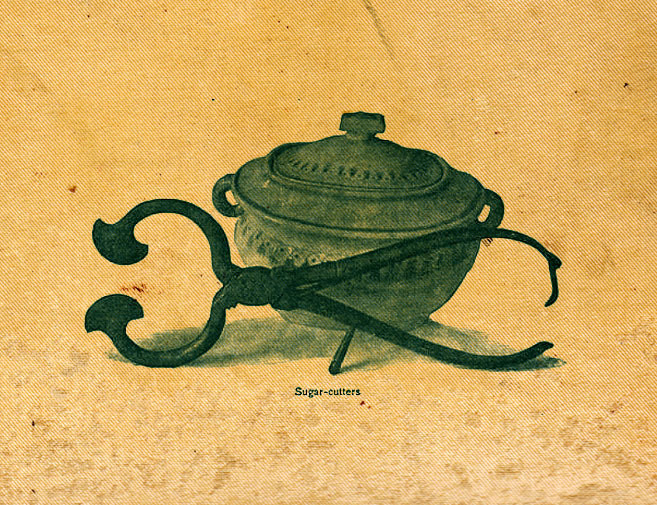 The illustration above shows the common sugar nipper. Now just a little tidbit of information, the aforementioned Havenmeyer’s which was originally named W. & F.C. Havemeyer Company for the two brothers in business together and began around 1800. Later in the mid to late 19th century they renamed themselves the American Sugar Refining Company to show their leading status in the industry. 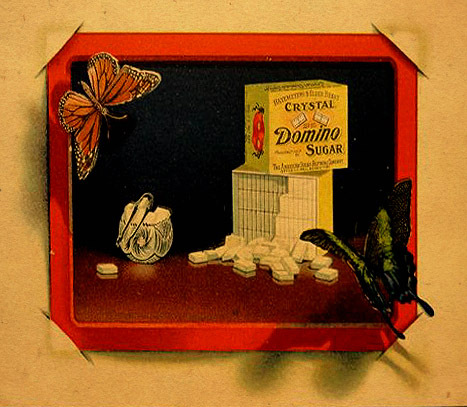 But to circumvent the growing sentiment against monopolies stirred by President Roosevelt around 1900 they changed their name to a brand called, Domino – named for the domino shaped cubes. This name might be familiar to many as we can still find this brand of refined cane sugar on the shelves today. Although no longer will you find it coming in the cone shape, nor wrapped in blue or purple paper. Instead a bright yellow and white packaging will greet you. If you would like to experience a loaf sugar like days gone by you could purchase one here at Jas Townsend & Son, Inc. Just as a disclaimer I am merely sharing this link as I am not affiliated with or compensated from this merchant.